In January 2011 Computing surveyed 150 technology business decision makers at UK SMEs to establish the “state of the nation” in the content and endpoint arena, and to see whether the growth of the cloud has persuaded such organisations to move on from the traditional on-premise content security delivery model. The survey looked at the features that both cloud and on-premise users considered important in a security system and also the glitches and teething problems experienced with each type. Just under half of the respondents were found to be utilising cloud services to deliver at least some aspect of their IT security (generally email and web protection) with about 50 percent of the remainder either researching the technology or taking active steps to adopt it. The fact that 75 percent of UK SMEs are either using or considering the cloud for IT security suggests that historic concerns about data security and loss of control have largely been laid to rest. Unsurprisingly, the most important feature of a security system in the view of the respondents was found to be the effectiveness of the threat blocking mechanism. Interestingly, the survey results indicate that cloud solutions are superior to on-premise security systems in this regard, with only half the number of cloud users reporting malware attacks as their on-premise counterparts. Availability and resilience also featured high on the list of desirable features. Again, this is an area in which cloud providers excel, guaranteeing 99.999 percent uptime in their SLA, a level that is virtually impossible to match using in-house systems. 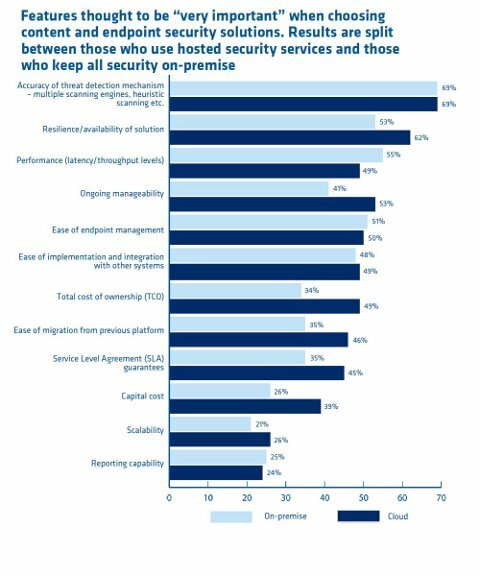 And users of cloud security systems rated ongoing manageability more highly than their on-premise counterparts. This suggests that ease of management played a part in their decision to deploy managed cloud services, as these are indeed much more straightforward to manage. The cloud might not be appropriate for every organisation and there will undoubtedly always be those with good cause to preserve in-house systems. However, the survey results propose that a tipping point might have been reached, with cloud services now thought the norm rather than a newcomer that has yet to prove its credibility and trustworthiness. This entry was posted on Wednesday, April 13th, 2011 at 6:30 pm and modified by WebMaster View on Saturday, March 22nd, 2014 at 5:54 pm. You can follow any responses to this entry through the RSS 2.0 feed. Responses are currently closed, but you can trackback from your own site. How Will Google +1 Change SEO?